Joe Nemechek picked up the 5th last-place finish of his NASCAR Camping World Truck Series career in Friday’s Lucas Oil 150 at the ISM Raceway when his #87 D.A.B. / Fleetwing Chevrolet fell out with electrical problems after he completed 11 of 150 laps. The finish, which came in Nemechek’s 55th series start, was his series-leading third of the season and first since Mosport, five races ago. In the Truck Series last-place rankings, it was the 8th for truck #87, the 35th for electrical problems, and the 364th for Chevrolet. Across NASCAR’s top three series, it was the 51st for the #87, the 121st for electrical woes, and the 1,636th for Chevrolet. 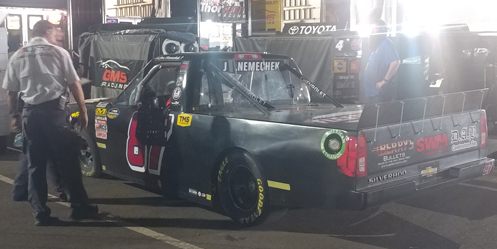 Since Mosport, Nemechek ran back-to-back races in the #87, most often on “start-and-park” duty, finishing 31st at Las Vegas and 30th despite a strong 7th-place qualifying run at Talladega, both due to vibrations. At Texas, it was Timmy Hill who gave the #87 a strong 11th-place qualifying run, the best of his NASCAR national series career, before he too parked the truck. In the same race, Joe ran his son John Hunter’s #8, and with sponsorship from Tweaker Energy and Romco Equipment, started 18th and finished there. John Hunter returned to the #8 for the ISM Raceway, and Joe would regain his seat in the #87. Joe didn’t turn a lap in opening practice, but despite running the fewest laps of anyone in Happy Hour – five – he ranked a strong 21st of 32 drivers. He matched that lap in Round 1 of qualifying, putting up the 21st-best lap, then ran the slowest completed lap in Round 2 at 130.714mph (27.541 seconds), just one-thousandth off the lap of Austin Wayne Self. Stefan Parsons, driving Premium Motorsports’ #15 VIPRacingExperience.com Chevrolet that was brought to the track by Mike Harmon, didn’t turn a lap in Round 2. The preliminary entry list saw Bayley Currey as a late 32nd entry for the #63 MB Motorsports entry, averting the first short field in the series since last fall at Talladega. However, by Friday morning, it was Jesse Iwuji in the Mittler machine, bringing with him sponsorship from Zulu Audio and JBJE Transportation. According to a crewman on Iwuji’s team, the deal to drive the #63 came together at the last minute on Thursday. 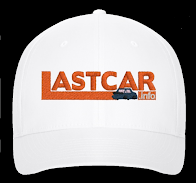 The LASTCAR implications were enormous - Currey had been the only driver entered who was mathematically in contention to take the LASTCAR Truck Series lead from Joe Nemechek with a last-place finish. 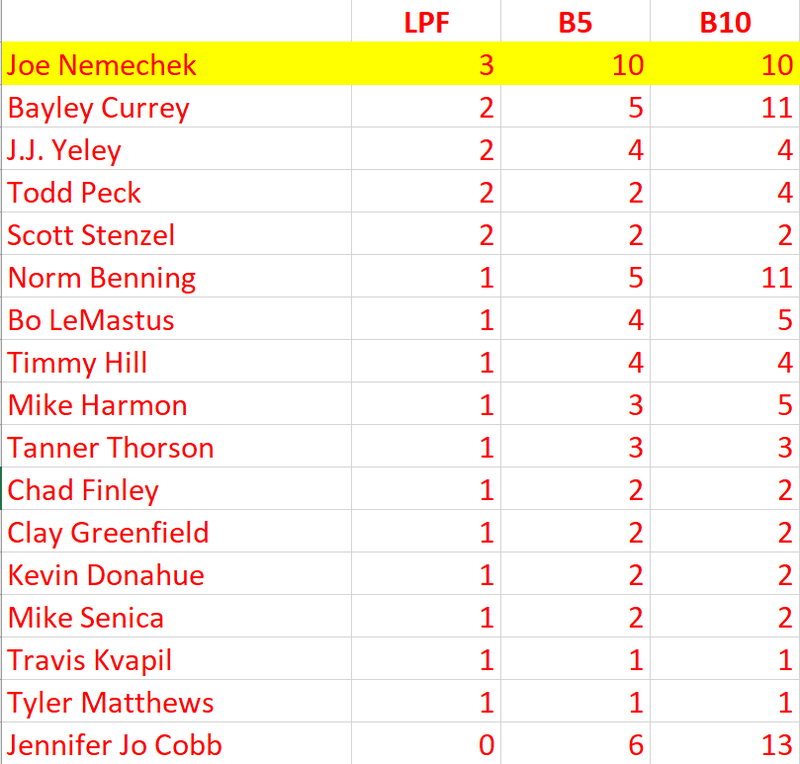 However, with Currey not entered, Nemechek now controlled his own destiny and was in position to put the title out of reach with a third last-place run in 2018. It was Iwuji who secured the 32nd and final starting spot in qualifying with a lap of 122.699mph, nearly two-tenths off the next-slowest truck belonging to Jennifer Jo Cobb. 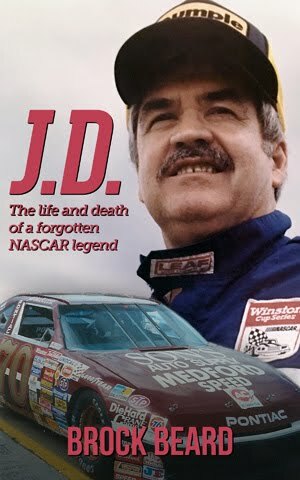 As the field rolled off pit road for the pace laps, Iwuji stopped briefly on the apron of Turn 2, then got going again as D.J. 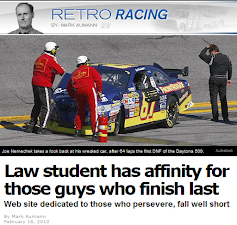 Kennington passed him in the #49 SobrietyNation Chevrolet. Iwuji regained his 32nd spot, but both Jordan Anderson’s #3 Commercial Property Services Chevrolet and the #15 VIPRacingExperience.com Chevrolet of Stefan Parsons fell to the rear, followed shortly by Joe Nemechek. Meanwhile in the garage area on the first pace lap, the Young’s Motorsports hauler for Tanner Thorson, another last-minute driver swap, began to back out of its stall. The tractor unhooked, then parked at the far end of the garage area. When the green flag fell, Nemechek briefly held the 32nd spot, but passed Iwuji by Lap 2, on Lap 4 had dispensed with the #10 Driven2Honor.org Chevrolet of Jennifer Jo Cobb, and on the 5th circuit passed the #33 YourGMSTruckStore.com / Zimmer Auto Group Chevrolet of Canadian driver Jason White. Iwuji and Cobb continued to lose touch with the rest of the pack, and on Lap 9, race leader Noah Gragson put Iwuji a lap down. Cobb followed soon after, pulling to the inside on the dogleg to let the faster traffic move to her outside. Then on Lap 12, Nemechek slowed in Turn 2 and began to give those spots back. Moments later, he pulled into the garage area. He originally made for the row of haulers closest to Turns 1 and 2, then made a hard right turn and parked where the NEMCO team worked on son John Hunter Nemechek’s #8 Hostetler Ranch / Stonefield Home Chevrolet. Nemechek dropped the window net, then climbed out as at least four NASCAR officials arrived. The driver brought out a flashlight and looked under the hood, then inside the cockpit. The crewman assisting him said it was to remove parts that belonged to NASCAR. Nemechek was done for the night. He was already wearing a headset, no doubt talking to his son, who was running 4th at the time. Finishing 31st was Jennifer Jo Cobb, who first pulled behind the wall under the first caution with a blown header. The crew jacked up the right side of the truck and worked on it for several laps before getting her back on the track on Lap 39. Cobb’s truck still sounded rough on the track and ultimately pulled behind the wall a second time, this time done for the night. 30th went to Austin Hill, who made at least one unscheduled stop early, then ran slow on the apron of the dogleg before he retired his #02 Young’s Building Systems / Randco Chevrolet. Finishing 29th was John Hunter Nemechek, who worked his way from 4th to the lead, gambling on a two-tire stop to take the top spot. On Lap 128, while holding off a charging Grant Enfinger, Nemechek lost control off Turn 4 and spun to the apron, flattening both right-side tires on his #8 Hostetler Ranch / Stonefield Home Chevrolet. The truck suffered further damage as he rolled around the apron, forcing him to call it a night. He slipped to 29th with 8 laps to go. Rounding out the Bottom Five was Justin Haley, whose #24 Fraternal Order of Eagles Chevrolet suffered a catastrophic oil leak under the Nemechek caution that encircled the entire track, forcing a red flag to complete the cleanup. 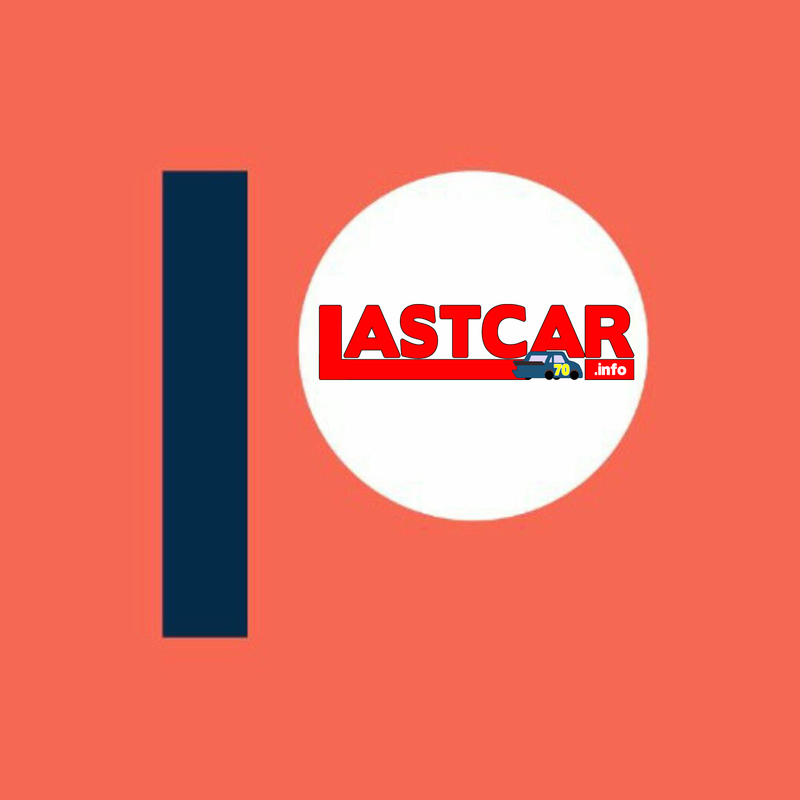 With the finish, Nemechek secured the 2018 LASTCAR Truck Series Championship. 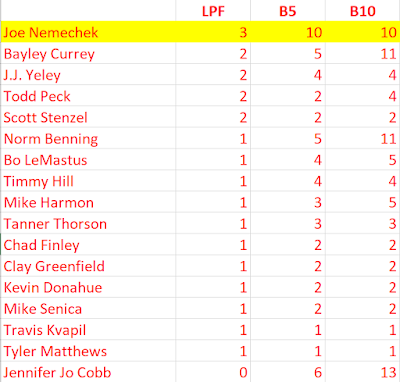 Though there is one race remaining, two-time last-placers Bayley Currey, J.J. Yeley, Todd Peck, and Scott Stenzel are mathematically eliminated, unable to prevail in a bottom-five tiebreaker even if any of them trails Homestead. It is the elder Nemechek’s third LASTCAR title, joining the Cup Series titles in 2008 and 2010. We caught up with Joe Nemechek after the race and talked about the challenges of operating an underfunded Truck Series team beyond John Hunter Nemechek’s move to the XFINITY Series. BEARD: Where is NEMCO Motorsports right now as to 2019? NEMECHEK: [It] depends on where we’re at and what we’re doing with what we have to do to get to the race track. We were fortunate to have some sponsorship this week with Stonefield Home. It’s just so hard to make it right now. We’ve had a tough year in terms of finding sponsorship. It’s taken its toll on me and the team. But we keep showing everybody each and every week, we come to the track and we have trucks to beat. And we’re trying to figure out what we’re going to do next year. John Hunter’s working on a lot of his stuff, so we’re trying to find another driver who has money who wants to come and race. We’re capable of running two trucks, so we just gotta keep trying to figure it out. But in this business it does take money to keep this thing rolling. We do a lot with a little here and it shows every week. BEARD: Is there anything your fans can do to help? NEMECHEK: Man, we need a corporate sponsor to step up here and spend some money and keep us on the right track. We have a lot of great people on this team – I guess I shouldn’t say a lot of us, there are four of us on this team – we work our guts out. We know what we need to do to win. Between my three key guys here, myself, and two others, we have so much experience and we’ve been doing this a long time. We know how to educate young kids, just like John Hunter. We know how to educate them and teach them the right way to race and give them competitive trucks. And you gotta figure that out over the time. And we’re looking for the next kid in there and make him a star. . .I don’t know how much John Hunter’s gonna run next year. He’ll probably run some, but we’re trying to find somebody who wants to run full-time and wants to go after a championship. *This marked the first Truck Series last-place finish for both Joe Nemechek and the #87 at the ISM Raceway.